2016 IPSD Celebration Plans... t/b/d BY YOU!!! 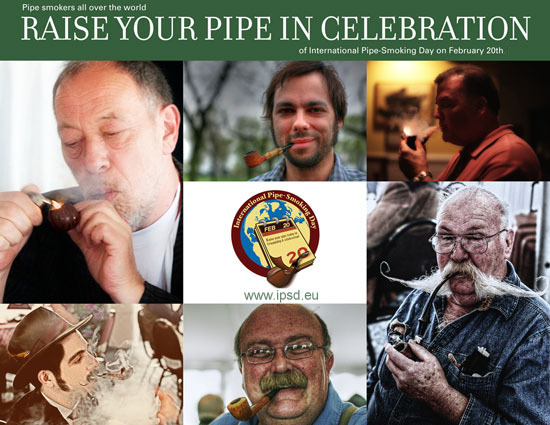 Please be sure to join your New York Pipe Club as we celebrate our Ninth Annual International Pipe Smoking Day (IPSD) Celebration! BUT, WHERE, IS THE QUESTION??? Celebrated the world over officially on February 20th, our event, this year, will actually take place on Saturday, February 20, 2016, but I have not found a venue yet. I recently sent out an email to query the Club membership in an effort to elicit a reply back from, as many of you who would be so kind as to read it and email your president back! I received a number of replies, all of which are in alignment with my thoughts for a location and I thank you for emailing me back! Like one reply that I received and agree with, I would love to keep the celebration in our fair city however, I am still working hard to nail down a suitable and comfortable location for us to celebrate together on what will be our 9th Annual IPSD Celebration! So, please continue make every effort to let me know if you would be available on Saturday, February 20th and what you think of the two alternate locations that I have considered for the day. Unfortunately, talks have not gone favorably with the management of an obvious, and past location so, that opens the door for a couple of considerations for us. My initial desire was to try to keep it local, so I figured we can meet up at our meeting home, Soho Cigar Bar in NYC; we all know this spot and we know that the Club is welcome there. However, there is a bit of an issue. I spoke to the owner inquiring as to the availability of the back area for Saturday, the 20th and unfortunately, two problems arose. The lounge doesn't open until 5pm and, there's a large party of 45 taking place at 9pm. They would like to accommodate us and can make an attempt at trying to open a little earlier for us but it is an unconfirmed situation. I'd like to give us a little more than 4 hours to celebrate and do not want to have to compete for space once the larger party begins to arrive. It's tough to plan ahead under those circumstances. I suppose on some level it is doable but personally, I am not comfortable with it. I am referring to the spot we head to after all of the NY Pipe Shows, of course I am talking about JR Cigar on Rt. 10 in Whippany, NJ. We could take advantage of the newly renovated lounge space, however, it would take a bit more effort and be a bit more challenging to get there - but I feel it would be worth it. Here's the challenge... JR Cigar is about an hour's drive from Midtown Manhattan and approximately, (sorry), two hours by train and bus. Please don't let that discourage you! Consider that the Club usually sends about 10-12 members to the Kaywoodie Event in December which takes place in Wappingers Falls, NY - that's upstate NY to us city folk! Maybe the "Chief" can offer some travel advice??? In any event, please don't let the travel discourage you and keep an open mind. I'm working hard to make any decision on a location as convenient as possible for all. Nothing is written in stone at all. But, I do want to hear from you and try to nail down a location by the end of this week. Remember, we can also, as we always do with handling the Kaywoodie Event travel distance, arrange for car pooling so please keep an open mind!!! Another nice thing about having the celebration at JR Cigar is that we would certainly welcome and open the invitation to other area Pipe Clubs, such as the Christopher Morley Club of Philadelphia and the local club, the NJ Fellowship of Pipe Smokers, who use the lounge for their monthly meetings. Obviously, it goes without saying that anyone and everyone who enjoys briar and leaf is welcome to join us - our motto, as always is, All are Welcome!!! As always, I want to do what is best for the Club, which is my motivation, always! Personally speaking, I would love to give JR Cigar a try this year. However, I want to hear to from YOU!!! Obviously, I... do not want to select a location that would prevent the majority of our beloved Club members from being able to attend. SO, please, LET ME HEAR FROM YOU!!! We have a short 3 weeks until the day. 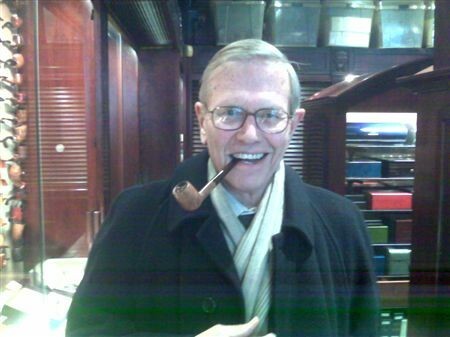 The New York Pipe Club invites all pipe smokers and those interested in the art of pipe smoking to join them in their celebration February 20th at a location and time to be determined - BY YOU!!! at a location to be determined. Of course, he'd be happier if he knew where we were celebrating! Unfortunately, talks have not gone favorably with the management of an obvious, and past location, (does anyone really want to pay an admission fee??? - I don't think that is appropriate especially in light of what the "spirit" of the day means - and, obviously we will patronize, as it is only right to do so, any location that welcomes us and opens their door to us, that goes without saying, right?) so, that opens the door for a couple of considerations for us. I want to query the Club membership and hopefully elicit a reply back from, as many of you who would be so kind as to read this and email your president back! I am working hard to nail down a suitable and comfortable location for us to celebrate together what will be our 9th Annual IPSD Celebration! So, please make every effort to let me know if you would be available on Saturday, February 20th and what you think of the two alternate locations that I have considered for the day. To keep it local, we can meet up at our meeting home, Soho Cigar Bar in NYC; we all know this spot and we know that the Club is welcome there. I will speak to the owner and schedule the celebration for a convenient time slot. Obviously, we could stay on at Soho well into the evening and there would be no need to head anywhere else as we normally would do in years past (we would usually end up at Soho Cigar Bar, anyway). We could also take advantage of a newly renovated lounge, however, it would take a bit more effort and be a bit more challenging to get there - but it would be worth it. I am talking about the spot we head to after all of the NY Pipe Shows, of course I am talking about JR Cigar on Rt. 10 in Whippany, NJ. JR Cigar is about an hour's drive from Midtown Manhattan and approximately, (sorry), two hours by train and bus. Please don't let that discourage you! Consider that the Club usually sends about 10-12 members to the Kaywoodie Event in December which takes place in Wappingers Falls, NY - that's upstate NY to us city folk! Maybe the "Chief", (hope I'm not overstepping my bounds by suggesting! ), can hook us up with a bus from a central meeting point or offer some travel advice??? In any event, please don't let the travel discourage you and keep an open mind. I'm working hard to make any decision on a location as convenient as possible for all. We can also, as we always do with handling the Kaywoodie Event travel distance, arrange for car pooling so please keep an open mind!!! As always, I want to do what is best for the Club, which is my motivation, always! Personally speaking, I would love to give JR Cigars a try this year. However, I want to hear to from YOU!!! Obviously, I... do not want to select a location that would prevent the majority of our beloved Club members from being able to attend. SO, please, LET ME HEAR FROM YOU!!! We have a short 4 weeks until the day. So wherever you are, lift a bowl and join pipers around the world for IPSD!! Then please join us at the Ninth Annual International Pipe Smoking Day Celebration on Saturday, February 20, 2016 at a location and time t/b/d. if he knew where we were celebrating this year!! !